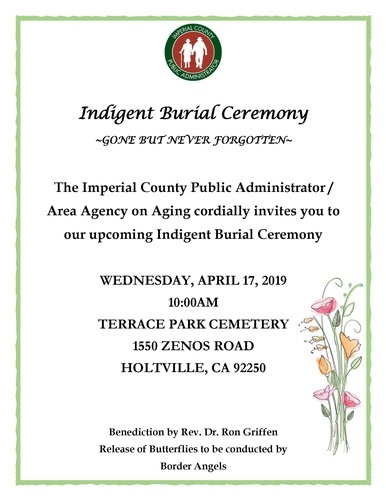 The Imperial County Public Administrator / Area Agency on Aging cordially invites you to our upcoming Indigent Burial Ceremony on Wednesday, April 17, 2019 at 10:00AM. Indigent Burial Ceremony will take place at Terrace Park Cemetery located at 1550 Zenos Rd., Holtville, CA 92251. Benediction by Rev. Dr. Ron Griffen. Release of butterflies to be conducted by Border Angels.